You never know where new gardening ideas and inspiration can come from. The other day I stopped by to help a friend water a garden by the river in South Felton while the owners were out of town. We both enjoyed the unique combination of plants and garden art placed strategically though out the garden. It was clear that this soothing garden was created with love. If gardening keeps you sane, don’t stop because of the drought. Covered with huge white, heavily ruffled flowers a Rose of Sharon ‘Helene’ anchored the entry to a small deck overlooking the San Lorenzo river. With a reddish-purple eye and handsome, leathery dark green leaves this attractive shrub will bloom nearly continuously over the summer and fall without setting seeds. 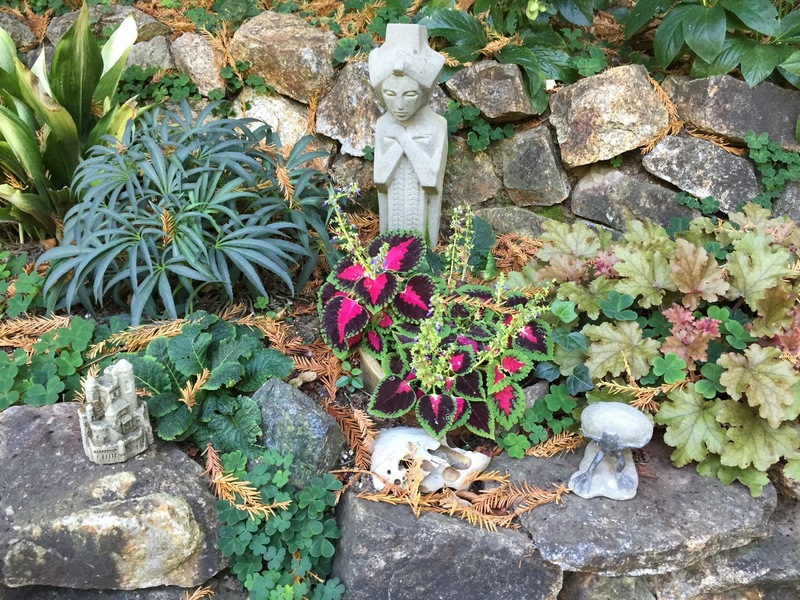 Other gems in this garden that caught my eye included a Japanese painted fern paired with a purple leaved coral bells. 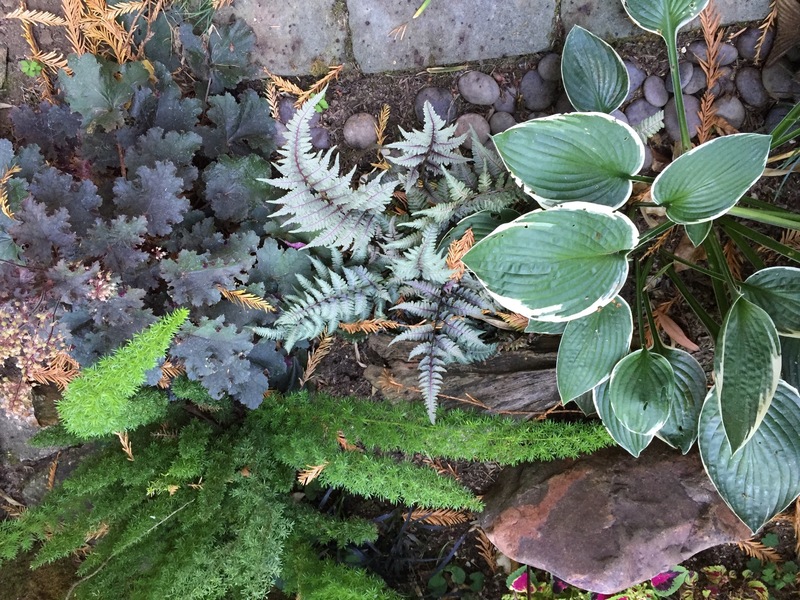 A foxtail fern and variegated hosta looked great nearby. 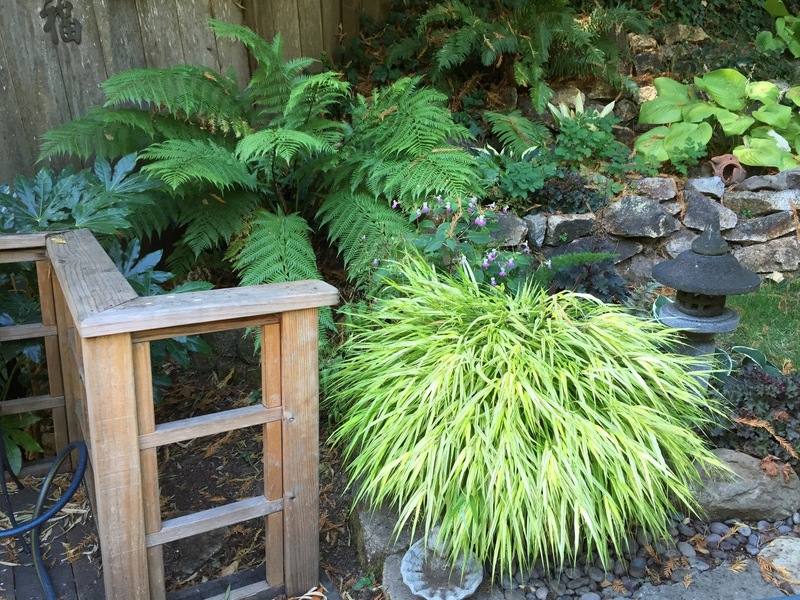 Japanese forest grass, oakleaf hydrangea, liriope, helleborus and winter daphne grew among the ferns. These are shade plants and most like a regular drink of water. They are combined with plants with similar water requirements in this garden but if your garden is in more sun remember that it doesn’t take a lot of water to make a garden beautiful. An unthirsty garden can fill you with joy. Gardening makes us learn new things. If you water less frequently, some plants may decline or even die eventually. Remove those that do and replace them with plants that will thrive with less water. Some to try as replacements are agastache or Hummingbird mint. Plant near your organic edible garden to provide nectar for pollinators as well as hummingbirds. The flowers are edible as a salad garnish, in baked goods and in cocktails while their foliage can be added to herb salads or in a cup of tea. 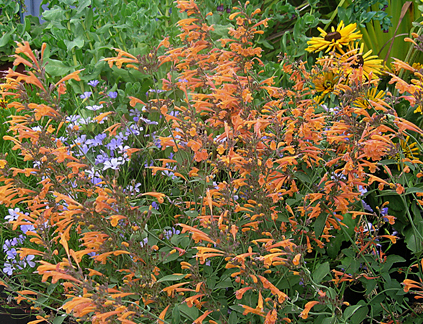 Other perennials that bloom now and into fall include asters, gaillardia and all the salvias. California fuchsia are just starting their long fall bloom cycle, too. I like the bright flowers of gloriosa daisy, especially the longer lived Goldsturm variety. These perennials make good cut flowers and are tough and easy to grow. They are descended from wild plants native to the eastern U.S. but require only moderate water once established. Need more late summer perennials to extend your season? Coneflowers will continue to bloom until frost then go dormant for the winter. Now days there are many colors to choose from in addition to the traditional rosy purple daisies. They are lightly fragrant and make good cut flowers for bouquets. The clumps spread slowly and can be carefully divided after 3 or 4 years. If faded flowers are left in place, the bristly seed heads provide food for finches in winter. The herb echinacea is derived from varieties of this flower. Echinacea purpurea and other varieties are used as a fortifier of the immune system, mainly to prevent flu and minor respiratory diseases by increasing the body’s production of interferon. The roots are the part of this plant used for medicinal purposes. Echinacea was used by Native Americans more than any other plant in the plains states. It was used to treat snake and insect bites because of its antiseptic properties and to bathe burns. They chewed the plants roots to ease the pain of toothache. It was also used for purification. The leaves and the flowers can be used in teas as well. Enjoy unthirsty color in your garden this fall.